"My Daddy Drives A Big Rig" Baby Bib- makes a nice little baby gift. Maybe, a set in different colors. I'm sure the expecting Daddy to be would really love it. Can be made for a baby boy to. 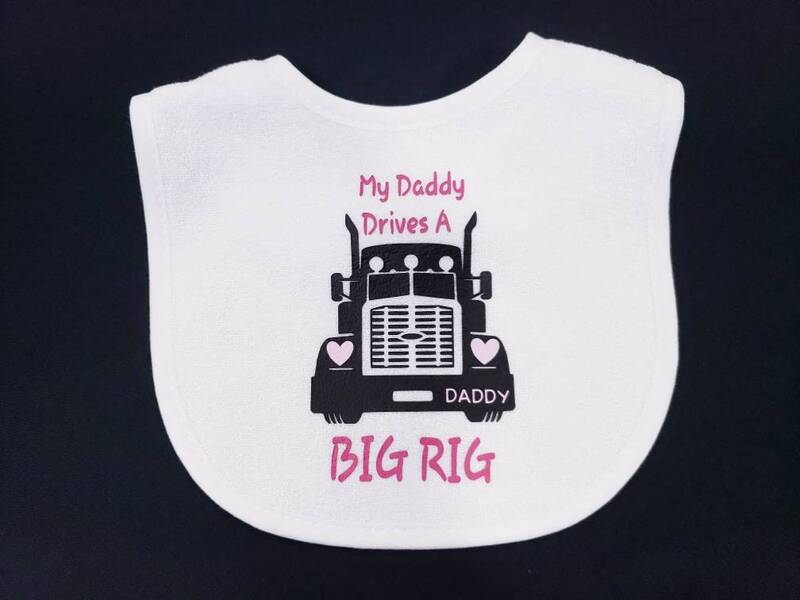 • 1 velcro back white bib with big rig & "My Daddy Drives A Big Rig" custom made in your color choice of htv vinyl. The primary color will be the htv for the words. This can be custom made in many colors. Send me a message and we can get your gift started. Looking to purchase a set? I would love to help. Send me a message with the amount of bibs you would like and we can adjust the pricing with 10% discount off every bib after the first one. Looking for a matching onesie? Here's the link.